To comply with the terms of the Community Benefit Agreement, the Fund stipulates Terms & Conditions for applications. Please take the time to review the conditions detailed below. Only applications from individuals, community bodies, groups, schools and similar within the boundaries of the Eaglesham and Waterfoot Parish's are eligible for consideration. 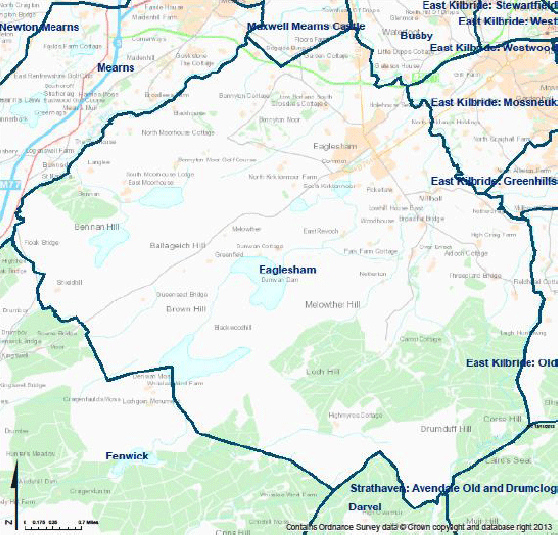 The Eaglesham Parish boundary is defined in the map shown below. The Waterfoot Parish map is pending. The minimum amount that can be applied for is £500.00. Applicants must complete the formal Fund application form and submit this online with the appropriate supporting information as detailed on the Form. The Fund will provide you with an update of the progress of your application within two weeks from the date the application is submitted. Applications must be submitted and approved before commencement of a project. No retrospective applications will be considered. If considered necessary, The Fund reserves the right to request any additional information or plans. Priority of funding will be given to applications which support strong community involvement, improve local infrastructure, support local events, enhance the environment and protect local heritage. Applications that are seen as campaigning on specific political or religious positions will not be considered. Applications that are seen as campaigning against renewable energy development or sustainability will not be considered. Applications will be considered by a funding panel and applicants will be notified by email whether this has been accepted or rejected. Grant payments will be paid by BACS and paid as a single payment i.e. no staged payments will be made. It is important that the work of the Eaglesham Fair AOE Community Benefit Fund is acknowledged in any published materials that relate to a grant funded project. If an application is successful, organisations or individuals are required to acknowledge the contribution of the Fund in any publicity they might produce and allow and participate in any publicity that the Fund might organise.